Studying for final exams is extremely painful and the only rule that applies during exam season is, “No study, no grades”. Exams are on the way and it does not mean that you can slack off and sip iced tea by the pool side, this is the time to focus on the studies. We all have heard of that student who studies only for a couple of hours and score more than the bookworms in class. Studying is not enough to land the desired grade, successful students consistently apply a series of strategies with a view to attain identified learning and grades throughout the academic term. Here, we present CBSE solved question papers that will give you an idea about the pattern of the exam and the marking scheme. The previous years solved question papers help students to get rid of the fear and learn a lot about the type of questions asked, which beat stress. Give yourself plenty of time to study – Don’t leave it until the last minute. It is widely accepted that last minute study is not a good way to appear for an exam. Set a timetable and organize your study according to the priority of an exam. Maintain a balance that you feel comfortable with. Maintain your study space – Your surroundings really affect your learning power. Make sure you have enough space to scatter your notes and textbooks. Sit where there is enough light. Wait! Is your computer and mobile phone out of sight? Use digital mode of learning – A study shows that human mind retains the knowledge which has been grasped by audio-visual aids. Prior to the exam get your ideas down, it will help you to quickly recall everything you have learned so far. 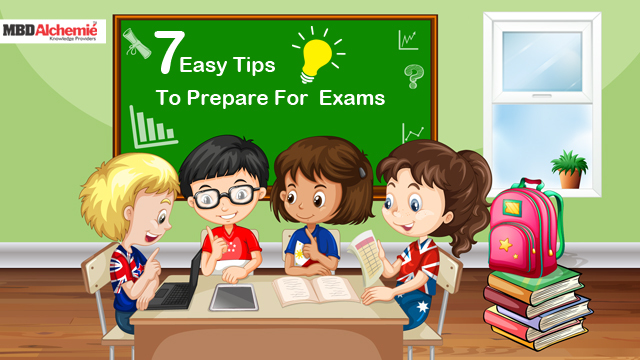 Practice old papers – It is one of the old and most effective ways to prepare for exams. This not only gives you an idea about the type of questions you need to prepare, but also give you a format and an idea for how to manage your time per question. Assign a time slot for every task – Depending on your preferences, you need to assign one subject to one time slot. So, while dividing your syllabus, make sure that you mark the priority properly. Complete the task within the assigned time slot to manage your time. Don’t be stiff – Exceptions are always there, so be flexible. If you could not achieve you set goal for a day, do not get radically upset or disappointed. Make slight adjustments in the next day schedule to manage your work. Be flexible in your timetable, so that you can bend according to the demand of the situation. Get a good night’s sleep – Some students find it enticing to stay up late studying, but the fact is you need energy and focus to write an exam. A good night’s sleep is necessary to energize you the next morning. Also find out some tips to improve your concentration while studying. Try to focus on the task at hand, i.e. focus on the activities of studying for and responding to questions on the exam rather than on potential negative consequences. Nice Post. Yeah, I definitely agree with you with each and every point that you have discussed with us. Easy tips and great understanding.